Around here, the salvages don’t stop. Continuing on from my salvages from an undisclosed location, here are some more items that I had managed to rescue from certain destruction for a chance at a second life. The Extron DVI-RGB 150 is a standalone DVI to RGBHV interface, commonly employed in professional applications, for example, to hook up a projector connected through a long-run 5-coax lead set terminated in BNC connectors to a computer at a lectern. The unit accepts an IEC cable power input, with single link DVI input, buffered output, RGBHV with composite sync and sync on green configurability, and configurable EDID source and EDID data. The front panel also allows for the signal gain to be adjusted, as well as high-frequency pre-emphasis peaking control. The sides of the unit are well vented, with QC stickers along the right side. Additional holes are provided for a rack mount kit, which wasn’t anywhere nearby. Don’t have a manual? No problems. Everything you need to know is helpfully plastered on a large label on the bottom. I like that! I ended up salvaging five of these units, all of which were plastered with notes claiming “dead” or “drops input”. Once they had been bought home, none of them powered up or had any sign of life, so lets take a look inside. Six Philips screws need to be removed to release the top casing. Internally, most of the unit is just “empty space”. It is constructed as an amalgamation of the main board at the bottom, and a power supply module from FSP (FSP012-2P01). This unit appears to be a Version 1.01 unit. Having also taken a look at the other units, there was one with Version 1.02, which featured adjustable resistances for each channel gain as well – all the analog stuff is on the left side of the above image, including an LT1399CS triple-channel 300Mhz current feedback amplifier. Underneath the label is a Lattice LFEC1E-3TN100C FPGA. There is also some greenwiring going on, so it seems there may have been an error with the PCB or some unroutable trace that had to be “fixed up”. The rear BNC connectors look a little hacky in the way the centre pins are connected to the PCB. That probably isn’t quite the best configuration for impedance matching purposes, but it’s probably okay. The underside is not equipped with many components, but it has some very important ones – namely a Texas Instruments TFP401APZP Panelbus Digital Receiver. Now, time for the problem part – if you guessed bad capacitors in the power supply, you’d be right! It seems that FSP had no qualms about using OST branded caps, all of them on the secondary side have bulged and are in various stages of venting. The OST branded cap in the feedback section seemed to be okay, probably because it didn’t need to handle any significant levels of ripple. The main board, however, had all Japanese Nippon Capacitor caps which are all fine. The power supply had heatshrink over the primary capacitor for “explosion” protection. Cutting away the top part, we can see Nippon Chemi-Con caps on the primary side, which don’t visually appear distressed and are probably fine. However, after examination of all five units, I did meet two particular exceptions. One had a different capacitor, which had heated up so badly that the plastic wrapping was crusty and was obviously bulged. Another was a Nippon Chemi-Con capacitor with a leak out of one of the legs. This one got repaired by replacing all secondary capacitors, and a residual 50Hz ripple was clearly visible on the outputs which gave away a bad primary capacitor. This was more obvious once you notice the small crust residue on the PCB. Desoldering the capacitor, the positive leg literally “fell out” of the capacitor, indicating it was probably fully corroded through. If your primary capacitor is okay, then you can omit the 22uF 400v part. After scrambling to element14 and buying a variety of Matsushita (Panasonic) and Nichicon capacitors, I repaired all five power supplies. After this, all five units were recovered to working condition. Not that I really needed them, but it was nice to have something to fix. Examining the outputs with my oscilloscope gives a very nice chance to describe what is essentially the analog VGA signal. For example, this is the plot of the signal with green video amplitude on A, and V-sync signal on B. The V-sync signal is a TTL level signal that goes low at the beginning of each frame. There is some “space” between this signal and the beginning of the active lines, and smaller space between the last active line and the V-sync signal, which forms the “porches”, providing time for old fashioned CRTs to drive the beam from the bottom back to the top. Plotting the green video amplitude on A, and H-sync signal on B, we can see the anatomy of a single video line, which resembles the same sort of arrangement as the whole frame. This has the output adjusted to the minimum output level. This has the level adjusted to the maximum level – this allows for the converter to put out a higher voltage signal to overcome resistive losses in the cable. Turning the boost control up allows for the compensation of capacitance from long cables which cause high frequencies to be lost (and hence, a soft picture). This can be seen as a bit of signal over-and-undershoot. This unit got given to me as “dead” for dissection – it’s a fairly good looking unit (from the outside) which we were using to run a Raspberry Pi. The unit claims to be “Designed in New York”, which seems rather interesting, since it’s a play on “Designed in California”, commonly used by other trendy *ahem* computer peripherals, and creates the impression this is US-engineering. Opening this unit was a little tricky. First of all, there were only two screws visible from the outside, that were triangular shaped. I didn’t quite have the right bit, but got both of them out. The unit still didn’t come apart, and the power plug felt like a removable “multi-country” connector, so I tried to pry that off. Oops! As it turns out, that’s not the right way to open it. You can pry along the edge of the case and slide the shell off first … oh well. Next time, maybe. What we find inside is some very generic, sad-looking PCB for a charger with up to three USB ports. The board itself has ONLY nasty branded capacitors – two parallel AsiaX capacitors on the primary, a bulging LSHK branded capacitor on the secondary. There was a controller IC on the underside, which was unmarked, which I didn’t photograph. The primary side fuse showed continuity, so the failure is probably not major. I tried to address the only visible deficiency – the bulging secondary capacitor. It was replaced and a new set of wires soldered to the board, but it still didn’t run. I suspect something more nasty may have happened. I probed it while powered, and it seems the primary side rectification was fine, the primary side caps charged up just fine, but the secondary remained staunchly dead. It wasn’t worth probing any further as it can be slightly dangerous to work with mains-powered products, so it was disposed of, but it seems that the flashy exterior hides a secret – low quality components inside. It may have been a open burnt-out primary or secondary turn on the transformer, or a shorted secondary turn. Otherwise, the controller IC may have been damaged. This was another product given to me, on the account it was not functioning. It’s quite dated now, and its utility is rather low, but I couldn’t resist at least taking photos of it and taking it apart. Never having bought a branded desktop computer from the majors, I’ve only really seen the branded graphic cards from third party companies with their own branding. 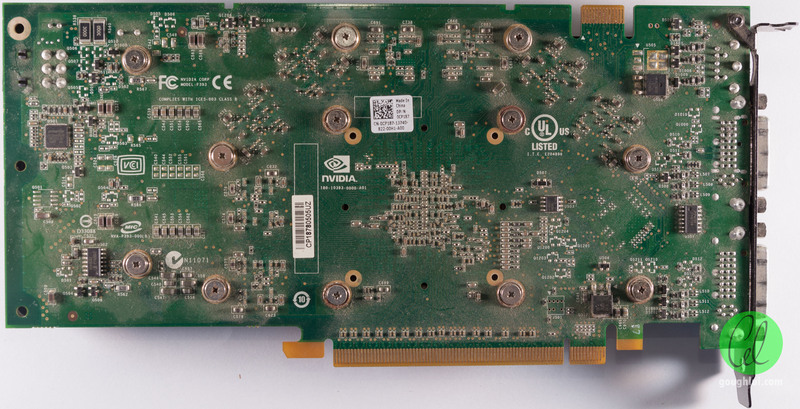 It was rather elegant to see the simple Nvidia reference design OEM motifs on this card. It was rather dusted from the Dell system it came from, so it was probably well-used and its failure not unexpected. Even though the card was of a reference design with reference cooler, it seems they did a good job in trying to cool everything from VRM to VRAM in addition to the GPU. The thermal pads and thermal paste layers were pretty thick, so the cooling effectiveness might be a little questionable. The fan featured 4-wire PWM control. Cause of failure? It seems obvious, just looking at pretty much all the channels clogged with a mat of dust. It’s probably run many years, cooking away at high temperatures until it can’t take it anymore. Heatsinks with many thin channels maximise surface area and improve cooling, but as soon as dust collects on the leading edge, the air cannot reach the cooling fins of the heatsink, and the effectiveness drops markedly. This is why it pays to keep an eye on your temperatures and clean regularly. The other thing I found was that the fan was a little gummy and didn’t spin too freely. Ageing fans with failing bearings will spin slower, and eventually stop, and cause overheating. Sometimes it pays to replace fans as well, especially if they’re found to be slowing down or rattling. The top of the board was cleaned off, for a photo. It seems this card had a warning buzzer installed on it, but I’m not sure if it would have been used to warn of overheating. Nothing else was obviously wrong. I tried my best to revive it by going over most of the components with a heat gun in turn to reflow vulnerable components. I also tried to get the card VBIOS reflashed via nvflash, but it was never recognized, and the fan stuck at full speed, thus I suppose the GPU was toast. “You win some, you lose some,” is probably the mantra to live by when it comes to salvages. Often times, things are disposed of because they are broken, but there is a chance it can be fixed. Where it can, it’s a great chance to save something from being trashed; but even if it can’t, it makes for a good learning experience and some nice photos. This entry was posted in Computing, Electronics, Salvage and tagged cheap, made-in-china, repair, salvage, teardown. Bookmark the permalink. Hey, what scope do you use? This is a 2-ch 25Mhz 100MS/s (when running in dual channel) + arbitrary waveform generator which is USB 2.0 connected. For video work, it’s probably not the best choice – ideally, a higher bandwidth (250Mhz+) scope with dedicated video triggers and more channels might be helpful, but I use what I have. Excuse me, but you missed a full stop in this sentence: “Otherwise, the controller IC may have been damaged”, it is slightly uncomfortable to read. Could you correct it, please? It has now been fixed, although it is an exceedingly minor issue and doesn’t affect the meaning or intention in any way. Generally with minor typographical errors such as this, I would not bother to edit an article just to fix it due to the flow-on impacts (e.g. losing efficiency due to cache clearing, causing crawlers to re-download and re-index pages) to the site’s operation.